The compentence in the sectors of scissors and cutting tools is an ultracentenary tradition of Premana District, a small town in the mounta ins, between Valsassina and Vavarrone, in the province of Lecco. Here more than 100 companies dedicate themselves to the production of scissors and knives. The strong concentration of the production chain of cutting items in this place is due to the technical-productive culture of iron processing. Thanks to the tradition handed down from generation to generation, and to a strong love for the territory, Premana has become a global symbol for cutting itemswhich is dedicated to the development and creation of differents products: beauty scissors, scissors for textile, for hairstyilists, for the kitchen, for agriculture and knives for whatever use. The aim of every single company in Premana is to create professional products, characterized by a high quality level. The experience of 300 years of history, along with the most advanced productive technologies, give to Premana Brand a globally recognized guarantee. The Collective Brand of Quality is acquired by the Chamber of Commerce of Lecco, which is its Managing Authority and has the taks of evaluating, allocate and control the requirements of the Brand. The aim of the conferment of the Collective Brand is to increase the value of Premana’s cutting items production, and especially to guarantee to the customer the high quality level of the products, in conformity with the technical-productive requirements of the production Procedural Guideline. 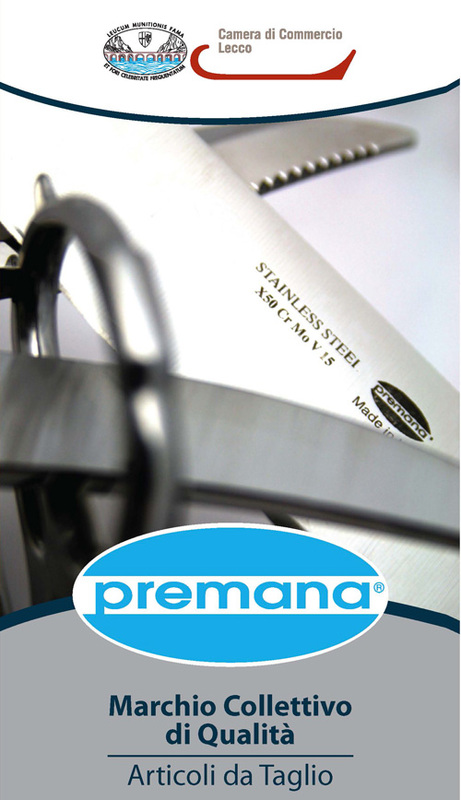 To be authorized to show the Brand “PREMANA”, the stainless steel used must present attested chemical-physical properties, and the respect of the regulated productive process must be guaranteed.